Whether you’re a basketball fan or not, we’re sure you experienced Linsanity at some point watching unheralded Jeremy Lin take the NBA by storm for a stretch during the 2012 season. With the Linsanity movie making its way to NYC for a screening, we had dinner at Ngam in the East Village before catching the movie. Ngam is best known for Thai comfort food and owned by Hong Thaimee. She has worked in some of New York City’s best restaurant’s including Kittichai, Jean George’s Spice Market, and Jean George’s Perry St.
Before sharing with you what we ate, we’d like to point out the great decor and atmosphere inside Ngam. From the Julia Child quote on the wall to the chalkboards and the big LOVE sign, Ngam has a welcoming feel to it. Click out the Vine video below to check it our yourself! Now for the food! We ordered spring rolls ($8) as our appetizer and Drunken Noodles ($14) and Fall Squash Red Curry ($14) for our meals. Thanks to our Yelp check in, we were able to have a glass of wine on the house! Allen: Love the sauce that came with the spring rolls. The Drunkeen Noodles were really good with a nice mix of carrots, peas and small pieces of brussel sprouts. 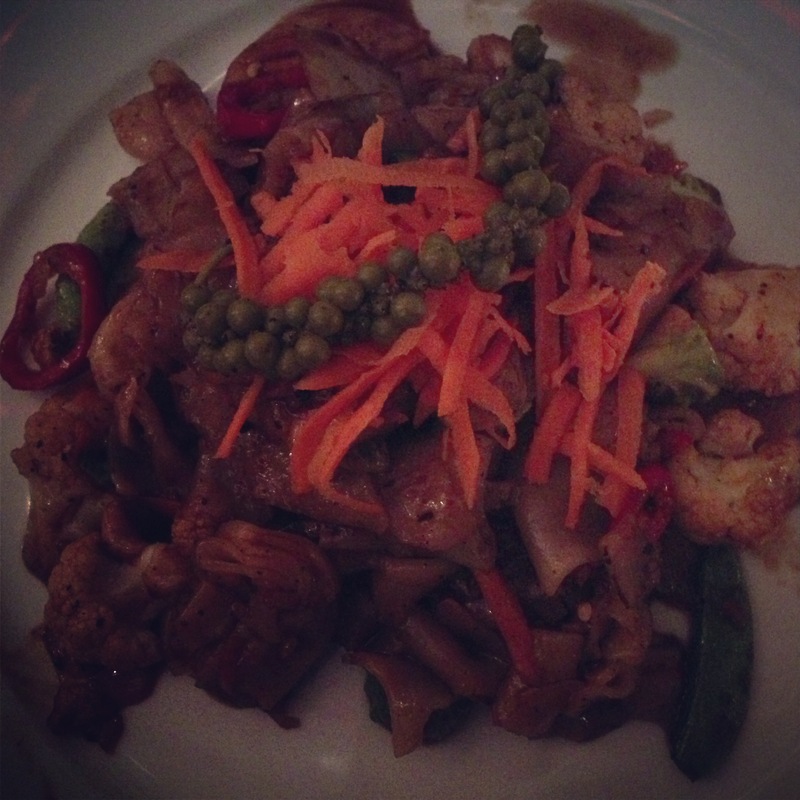 Being a big fan of spicy food, I was impressed with the spicy “kick” that went along with the dish. 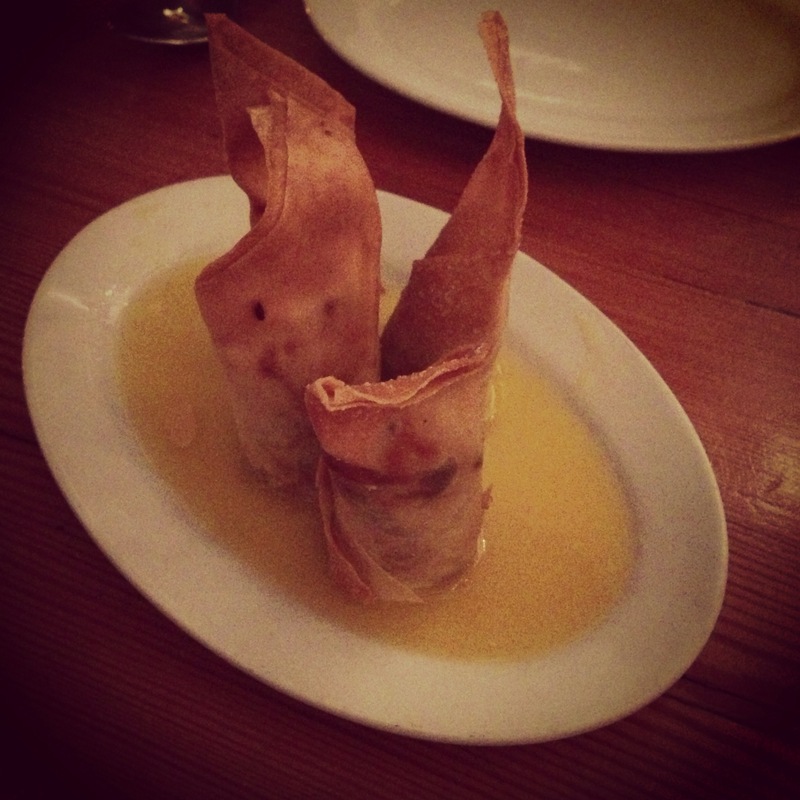 Kristina: The crunchy spring rolls were the perfect way to start the meal. Like Allen, I loved the tangy sauce they came with. 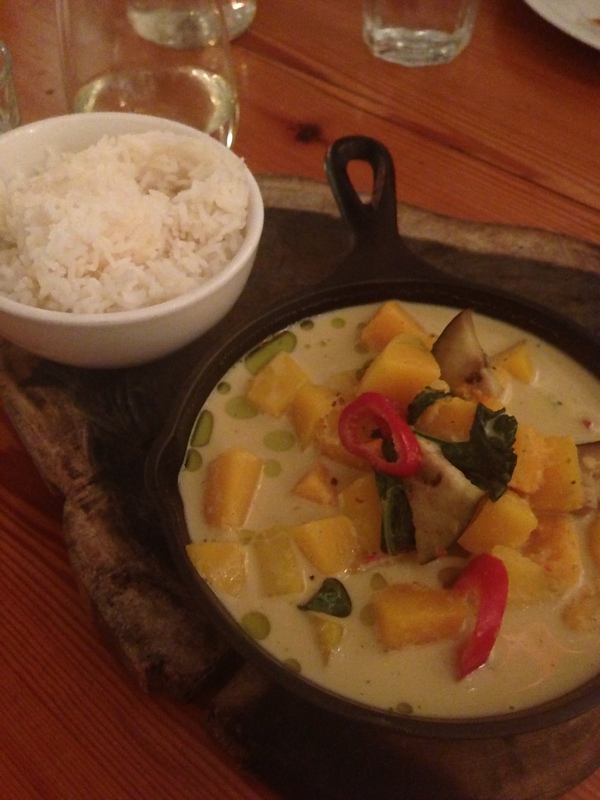 The curry was a delightful taste of fall on a place! It was flavorful and full of bites of delicious butternut squash, one of my favorite autumn items. Ngam has been reviewed by New York Times and the New Yorker but even though it is well-known, it maintains a casual atmosphere, friendly service and most importantly, delicious food. Have you given Ngam a try? If so, let us know what you thought! If it’s still on your list, let us know after you’ve given it a shot! Squash Soup for Meatless Monday!